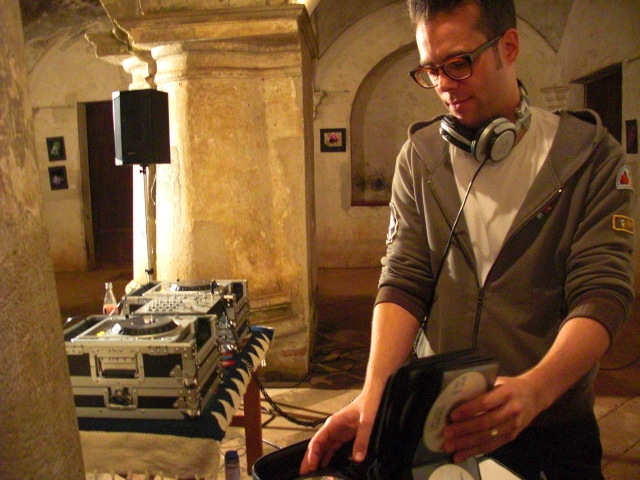 Is there a DJ in the Convento? BradElectro played his first Antigua gig this year at the opening of Club Fotográfico de Antigua’s photography exhibit in Las Capuchinas, an ancient convent of all places, and introduced his special recipe of house music to the art-loving audience. We had a town crier proclaim the event official, and the rain stopped long enough for the crowd to warm up to each other. For me the best part was actually preparing for the show, where we shared the intimacy of hanging up our work and sequencing the pictures on the wall. I also appreciated learning the technique of hanging matted pictures using fish line, toothpicks and masking tape. For a tutorial, watch a video of Nelo the master at work. Posted on Monday, November 9th, 2009 at 11:45 pm. Filed under: Blog, Team Guate Tags: arte, Convento de Las Capuchinas, fotos, photography	RSS 2.0 feed.